The seaport city of Dubrovnik is considered to be Croatia’s gem on the Adriatic. Named a UNESCO World Heritage site in 1979, Dubrovnik, often referred to as the ‘Croatian Athens’, is a visitor’s delight. Its ancient stone walls, dating from the Middle Ages, rise dramatically above the rugged mediterranean coastline, protecting the seaside city. Inside these walls, twisting stone streets await exploration, and restaurants and tiny boutiques abound. You can even visit the grand staircase where Cersei made her walk of shame in Game of Thrones and follow in her very footsteps! Proto, one of the oldest seafood restaurants in the city, boasts delicious and undoubtedly fresh fare (you will be presented with your fish before it is cooked) that can be enjoyed al-fresco, on its chic outdoor, covered rooftop terrace. Proto also serves freshly-harvested oysters from Ston, a nearby fishing village less than an hour’s drive from Dubrovnik, meaning ultra-fresh shellfish straight from the Adriatic itself! There are also some wonderful white Serbian Wines on the menu that complement the seafood beautifully, and the servers are efficient and knowledgeable, helping to facilitate a perfectly-paired dining experience. For a truly scenic and romantic meal, you must try 360. This beautiful restaurant, built on top of the walls of the old city, provides spectacular views of the harbor and brilliant blue waters below. The menu is creative and delicious, blending traditional Mediterranean flavors with locally sourced Croatian produce, and the wine list is excellent. If you are looking for a special excursion outside of the old city, go to the Trsteno Arboretum. The peaceful gardens and statuary date from the 15th century, making it the oldest arboretum in the world. If you look carefully, you can see where Olenna Tyrell and her granddaughter, Margaery, met under the trees on Game of Thrones. Make sure you engage a boat and guide for a day to explore some of the many small islands that lie just off the coast of the mainland. The Iron Throne resides on one of them. Our friend Karyn Lovegrove, a seasoned traveler to the coastal city, says jet skiing is a must. Just ask your hotel concierge to arrange, and a jet ski can be delivered directly to your hotel beach. This is a great way to explore the bay and take a closer look at the Island of Lokrum, as well as the back-side of Dubrovnik. Karyn also recommends taking a seaplane to the nearby islands of Hvar or Brac. If you go to Hvar, be sure to visit Palmizana a bohemian haven with a resort owned by Dagmar Meneghello, whose family has lived on the island for over 300 years. Or, if you visit Brac, home of the city of Bol, you will find the most amazing beaches. 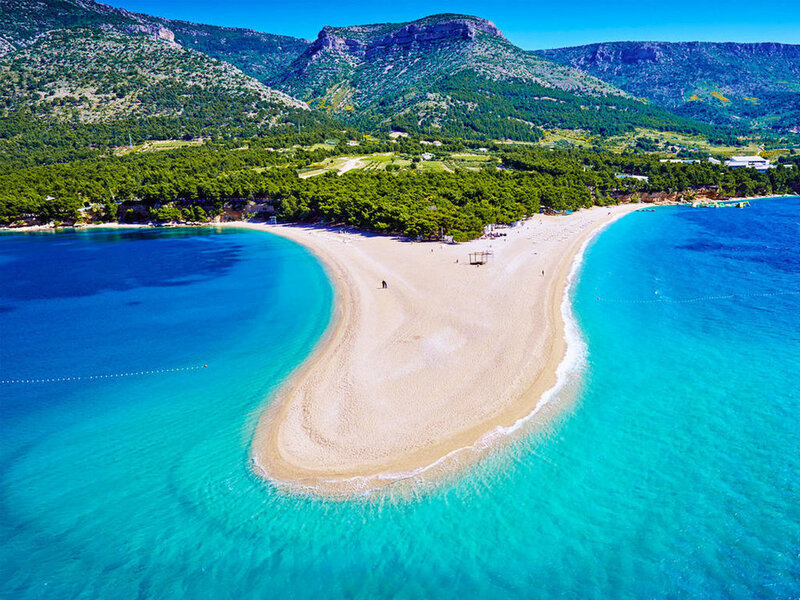 Zlantni Rat, meaning ‘Golden Cape’, is located on the southern coast of Brac and is particularly stunning. It takes about an hour to drive from Dubrovnik to Montenegro. Once there, immerse yourself in the past by staying at the Aman Sveti Stefan. The resort is an island made up of stone houses, winding streets and gorgeous ocean views. Originally settled in the 15th century, each individual stone cottage is now a room or a suite available to guests. The atmosphere is magical and the amenities are strictly 21st century. The island is connected by a causeway to the Villa Milocer, the former summer home of Queen Marija, and is now a part of the resort. The Villa contains one of the resort’s two dining venues, as well as an incredible spa and private beach. The hotel can arrange excursions to the nearby historic towns of Kotor, Perast, and Our Lady of the Rocks. All are accessible by boat and/or car.